Pamela Earnshaw Kelly lives in rural Pennsylvania and San Diego, CA. Her focus has been exploring the expressive possibilities of clay through animal imagery. She manipulates slabs of clay that are then formed by pushing from the inside, creating textures that express the nature of the creature she is representing. In her earlier work, she explored man's complex psychological relationship with animals using iconic images of farm animals. Beyond stereotype, each beast seems to have a soul. 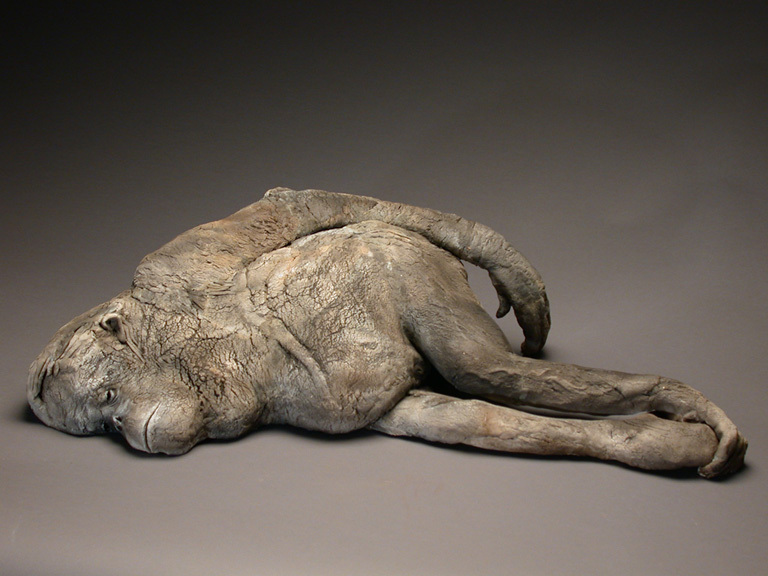 Her more recent Great Ape Series is less iconic and more political, using the individual animal as well as the medium itself, raku fired ceramic, to express the fragile organic nature of the subject matter and by extension of our fragile existence on the planet. Kelly has shown her work primarily in NYC with one person shows, including SOFA NY and Chicago. She has also exhibited on the west coast in Santa Fe and San Diego. Her work has been part of numerous publications on clay & ceramic art. We are pleased to have Kelly's unique and compelling sculptural works as a part of our gallery's program.